The Smash Hit Kickboxing Rank System- No testing, No stress, just the natural rewards of your Smash Hit workouts! "Performing the same explosive moves just like Chuck Norris or Jet Li might feel like flight of the imagination, but it is really possible. Our students routinely achieve astonishing mind and body results they had previously found unimaginable"
Why do we use a Rank System ? Most Kickboxing aerobic classes will push you to between 60% and 90% your maximum heart rate throughout the class, but what good are the moves if they're incorrect and provide no real value? Through the Smash Hit Rank System, while you're losing weight and getting into the best shape of your life, you'll also be developing and building real skills to help embolden your confidence and distinguish you as an real Martial Artist. Once you achieve rank you will know what we’re talking about. 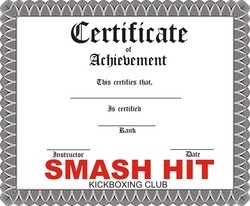 The Smash Hit Rank System is a learning process using real fight movements and strategies. The repetition of pre-designed practice sets creates the muscle memory needed to react reflexively in real-life danger situations. With each rank achieved, your body learns retains new “weapons”which will kick in automatically when necessary- your body will know what to do before your brain has time to think. That’s what makes it a fitness program with a means to an end- Self Defense. The Smash Hit Rank System has five levels- the first is the Red Rank, and the ultimate goal is the Black Rank. There is no testing associated with rank. We find the performance anxiety and nervousness created by rank testing to be unnecessary, as your instructor can recognize when you have gained the skill and technique which distinguishes each successive rank. You may then attend a rank workshop and go over the qualifications, and you'll also be presented with your newest rank achievement certificate and color rank shirt, which you may wear to classes..